The Solitary House by Lynn Shepherd. Bantam, 2013. Ebook. 368 pages. I chose to read The Solitary House because I was looking for a compelling mystery book that would fit in with both the Halloween and fall season, as well as the impending winter season (I like to prepare, okay?). Fortunately, The Solitary House delivered on all of these fronts and provided an intriguing, dark, and in-depth story to delve into. Shepherd takes inspiration from both Charles Dickens' Bleak House and Wilkie Collins' Woman in White, which truly shines in her work. Now, as much as this is an interesting mystery to follow, it's not exactly a lighthearted read. Indeed, there are some heavy topics and events discussed, ranging from gruesome murders to crude characters to discussion of young girls working as prostitutes. Despite these unsavory elements, this book is still written in such a way that it just captures your imagination and makes it difficult to lose interest. This story takes place in London in 1850 with Charles Maddox, former police offer turned solo investigator, is offered a new case that appears to be fairly simple, but ends up becoming much more than Charles bargained for. Charles is an independent young man who appears to have very little fear for the more dangerous parts of London. For this reason, he's an interesting character to follow, and I enjoyed that as the story went on, we began to learn more and more about his own past and family, as well as discover his own fears. We watch him go from feeling as if he is on top of his case, to realizing that he is in way over his head and that there are real, imminent dangers present. 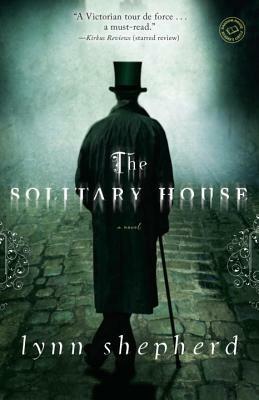 What I found most engaging about The Solitary House was the predominant narrator, who is an entirely unknown figure to us, the readers. The story also alternated briefly with a character named Hester, but these bits seemed quite brief in retrospect and were not my favorite points of the book. Our main narrator is long-winded and detail-oriented. What comes across as rambling on about various subject is in fact interesting and often relevant information to the story itself. What surprised me about this was that I never became irritated by this extended use of descriptions and languages, which is a testament to the writing and wit of the narrator, without whom I likely would have stopped reading this book. It is extremely Victorian novel style in this manner, and I enjoyed seeing the influence of Dickens and Collins in this writing. What I also found intriguing was that this third party narrator seemed to be telling the story from a modern perspective, which is only briefly noticed, but brought an extremely interesting element to it. I can confidently say that without these elements from the narrator, this story would have seemed exceptionally dry. Despite the fact that I enjoyed the long, extended details and perceived rambling, if this style is something that you have a hard time enjoying, then this might not be the book for you; however, I do still encourage you to give it a read! Overall, this is a well thought out and carefully crafted novel, dealing with both the filth and surface level violence of day-to-day life in nineteenth century London, as well as the deeper, psychological issues that plague life and the investigative work of Charles. For these reasons, I am giving The Solitary House four stars!